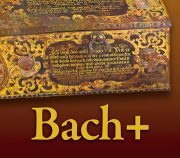 In celebration of the Oratorio Chorale’s partnership with the Portland Bach Festival, the Chorale presents Bach +, a concert featuring two Baroque vocal masterworks: Johann Sebastian Bach’s Jesu Meine Freude, one of his most beloved and intricate vocal works, and Heinrich Schütz’s Musikalische Exequien, which inspired the composition of Brahms’s Requiem 200 years later. Several members of the St. Mary Schola will participate as choral singers and soloists along with the Oratorio Chorale Chamber Choir. Featured instrumentalists are St. Mary Schola director Bruce Fithian, who will provide continuo accompaniment, with Philip Carlsen, cello, and Timothy Burris, lute. Adults $20 advance, $25 at the door. Students $10 advance, $12.50 at the door. Children under 12 free if accompanied by a ticketed adult, but tickets are required for seating. To purchase advance tickets, visit brownpapertickets.com/profile/1143574 or call Brown Paper Tickets at 1-800-838-3006.